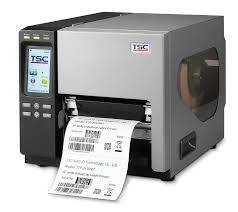 The industrial label printers from the TTP-286MT Series from TSC are specialists for particularly wide labels. They print on media up to 241mm (9.5″”) wide – even two or three-track multiple labels. Depending on the application you choose between a variant with 203 dpi and 300 dpi (TTP-384MT). The die-cast chassis and robust metal structure with a clear media view window meet industry standards and ensure for long running times. The standard version already features a large spectrum of integrated interfaces, including Ethernet, USB, serial and parallel ports. The Ethernet port ensures for the simple integration into existing network environments. A Bluetooth and WLAN module for wireless control are optionally available. Also integrated standard is a real-time clock – a must-have in numerous applications. The TTP-286MT Series features many user-friendly properties, such as the backlit 4.3″” touch display and 6 function keys, to simplify handling. The ribbon holder for rolls up to 600m long ensures that change intervals are comfortably few and far between.